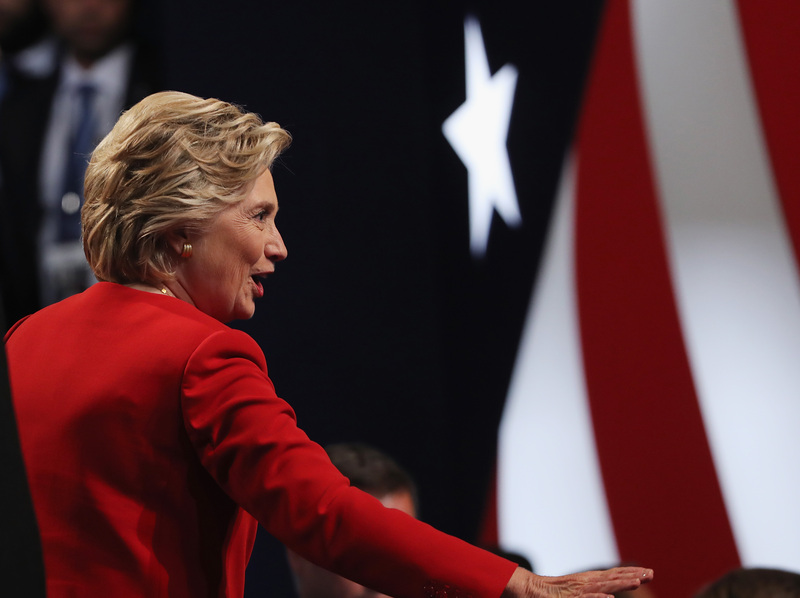 One thing about Monday night's debate was very clear — Hillary Clinton crushed it. She got the biggest laughs in the room, utilized effective rhetoric to communicate both her specific talking points and her overall message, and blew her opponent Donald Trump's largely unsupported and often completely inaccurate claims out of the water. If you're a Clinton fan, your election-related anxiety might be severely alleviated after seeing her performance, but it's absolutely critical to not to get complacent yet. The one thing to remember after the debate is that there are still five weeks until Election Day, and it's not over until the final bell. Even though Clinton proved a lot of haters wrong and should see a pretty significant bounce in her polling numbers after the debate, that doesn't mean this election is even close to locked up. Sure, it's a great sign for the Clinton camp that both pundits and the public generally agree that she was the winner in the debate, but for all the times that the United States thought Trump's campaign was totally finished, it has yet to happen. Against all odds, Trump became a serious presidential contender, then the Republican primary frontrunner, then the party's official nominee. Say what you will about Trump (seriously, please say it), but his campaign has an incredible persistency that can't be discounted for any reason. If your goal is avoiding a Trump presidency, the absolute worst thing that could happen in the wake of this debate is for Clinton supporters to get comfortable in their certainty that she's going to be the winner. That's part of the reason why Trump was able to pull back into a competitive range in polling numbers after the conventions — Clinton dropped out of the limelight, and people started turning their attention towards Trump. He became what was salient in the public's view and as a near direct result, his numbers started to rise. There's not enough time between now and Election Day to let that happen again, so if you want a Clinton victory, be sure to hype her up as much as possible. Elections, particularly in the age of 24-hour news cycles and social media, run on awareness and perception, and Clinton needs a lot of both of those things if she's going to increase her lead before Nov. 8. If you want Clinton to win, now is definitely not the time to sit back and relax, because you can be sure that Trump and his supporters are going to be working just as hard to get the numbers on their side too.